Post Hostel Prague i Praha, Tsjekkia: Bestill nå! 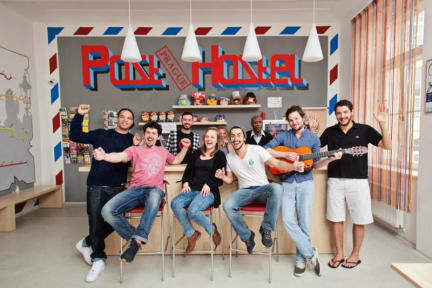 Welcome to Post Hostel Prague, the newest, brightest and charming hostel in the city. Our friendly and knowledgeable staff are on hand to assist you in making your stay an enjoyable and memorable one, whether you are going out or staying in! You will never be bored at Post Hostel Prague, where whatever the weather we look after all our guests, whether it’s games inside the hostel (PS4, Table Football, Darts, board games) or trips to local pubs or parks! Situated in the attractive Vinohrady district of Prague, Post Hostel Prague is only 5 minutes’ walk from one of Prague’s most loved parks (and beer gardens) Riegrovy Sady and a mere 15 minutes’ walk from the strict city center. Post Hostel Prague is where every traveler wants to stay.....and make friends with our lovable cat! We are highly motivated to help you find the most interesting experiences around, you will never be far from a welcoming and friendly face at Post Hostel Prague, and we will provide you with a place that you can call home! Fantastic room, good location and amazing staff. Will definitely come again! Very good value for money. A bit outside the city center, but the metro is just a few houndred metres away. The area is very quiet, and surrounded by good restaurants much cheaper than the ones in the center. The rooms are big and clean, and the staff is very nice and helpful. We got one of the rooms right next to the reception, which made the whole experience extremely noisy. People were partying all night, and were very loud. The ceilings were very high, so 10 people sounded like 100.